The day and date clock is the number one selling clock to alleviate the frustration of someone asking, "what time is it, what time is it?" This is a LARGE, old fashioned analog clock that shows the day and date with flip cards. If you have a patient that is regressing to the yester-years, this clock will be in their memory. The clock hanging in a nursing station or on the wall of a reception room in an elder care or elder law office will let visitors know without asking that this is a dementia friendly environment. Digital clocks did not exist fifty years ago. So a day and date clock using analog is a necessary device for all caregivers. Since people with Alzheimer's, dementia and memory loss have confusion about the current day and date, having a large day and date clock can help reduce the anxiety. For those dealing with Alzheimer’s disease, there is no greater gift they can receive than one that provides some comfort and familiarity. Being able to tell time is an essential part of life, but many people take it for granted. 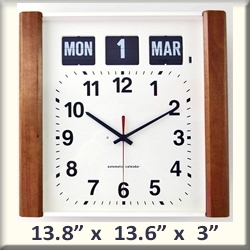 Alzheimer’s disease often distorts a person’s perceptions, which is why having a special wall clock can come in handy. A day and date clock allows people to know the day and time without looking at a calendar, adding much needed structure and predictability to a patient’s life. Alzheimer’s patients appreciate knowing the day and time because it adds some comfort, certainty, and routine. Our large print clock features easy-to-read letters and numbers so in an analog format that avoids the complications Alzheimer’s patients often have with digital timepieces. Even the clock itself is large, which makes it easy to see from a distance. Besides that, this durable clock is also useful because it keeps track of leap years. These clocks for the elderly are an investment in your patient or loved one’s piece of mind, restoring a simple sense of security that we frequently take for granted. Dimension: 13.8" x 13.6" x 3"
Height of number plates: 1.4"
Alzheimer’s patients appreciate knowing the day and time because it adds some comfort, certainty, and routine. Our large print clock features easy-to-read letters and numbers so in an analog format that avoids the complications Alzheimer’s patients often have with digital timepieces. Trimmed in a beautiful, solid-wood frame, this clock is perfect for both the home and care facilities - we like the way the day, date and month flip just like the alarm clocks from the 70s! Even the clock itself is large, which makes it easy to see from a distance. 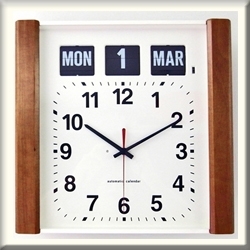 Besides that, this durable clock is also useful because it keeps track of leap years. These clocks for the elderly are an investment in your patient or loved one’s piece of mind, restoring a simple sense of security that we frequently take for granted.